6d. 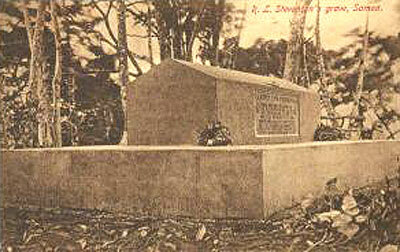 "Vailima," built by Robert Louis Stevenson, is the subject chosen for this value. Here Stevenson spent the final years of his life, and on Vaea Hill, shown in the background, up a steep forest track cut specially by the Samoans  "The Road of Loving Hearts"  his body was carried to its last resting-place. 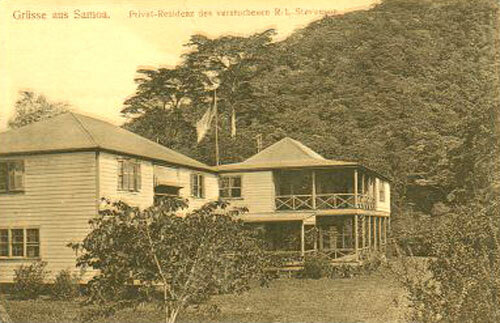 Stevenson's home is now the official residence of the Administrator, and the engraving pictures it from an angle showing the right wing and central portion of the building, which were built in Stevenson's time. The porch over the entrance is a modern addition. The border, incorporating a design frequently woven into Samoan mats, is narrow so as to provide as large a picture of "Vailima" as possible. Colour : Petunia. there will I be buried." Colours : Beech Brown and Violet. A guide is available to take you through the mansion, which features many of Stevenson's original belongings, including part of his library, mementos from his travels in the Pacific, and pieces of his family's furniture. The restoration was completed in 1994 and faithfully represents the interior decoration carried out when the building was first constructed in 1890, although several additions were made to 'Villa Vailima' after Stevenson's death in 1894. 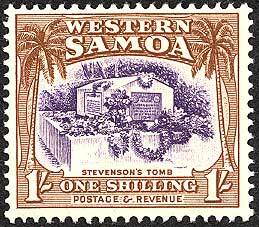 A 30 or 45 minute walk leads from the Museum to Stevenson's tomb at the top of Mount Vaea. The Mount Vaea Scenic Reserve is also well populated with birdlife. It is worth taking water and a picnic, as the view from the tomb is excellent. The museum is set within an attractive botanical garden, worthy of a few hours' wandering. Scott #166 ½d. A Samoan girl in Samoan dress is shown seated on a woven mat with a large kava bowl between her knees, dispensing this popular and ceremonial beverage from a cup made of the shell of the coconut, polished black. She wears a garment of "tapa" cloth, with a Samoan "fine mat" around her waist. Her necklace is of the much-prized shark's teeth, and behind her ears can be seen the attractive blooms of the hibiscus, greatly used for adornment. In the background is a scene characteristic of the coast  an indentation of the sea flanked by the coconut palms, and in the distance a Samoan thatched house ("fale"), which is so admirably suited to the climate. Colour: Apple Green. Scott #167 1d. 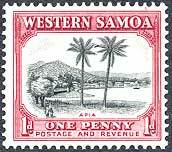 This denomination depicts one of the most familiar views in Samoa  that of Apia looking along the beach to the west, with the mouth of the Vaisigano River in the left foreground. This has been the scene of many historic happenings, for Apia has always been the seat of Government. 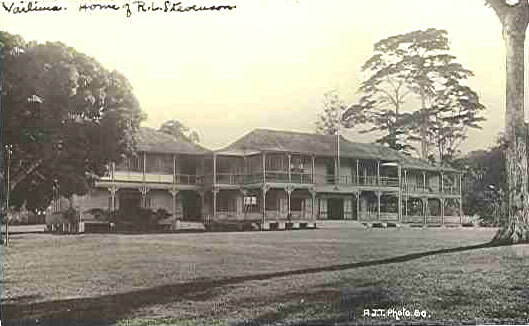 The present Administration offices are midway along the beach. 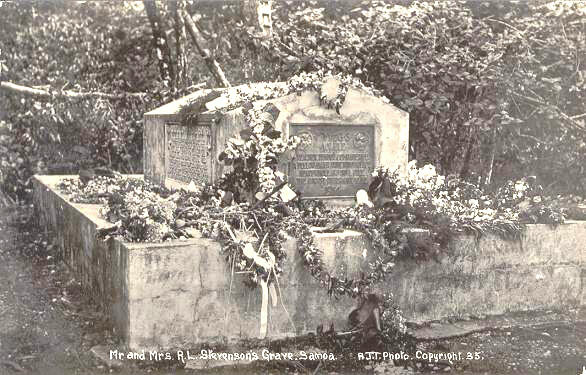 A small wooded peak behind distant coconut palms is Vaea Hill, at the top of which lies buried the famous novelist Robert Louis Stevenson. Two lofty coconut trees, so characteristic a feature of the Samoan landscape, are prominent in the foreground of the picture, which also includes some Samoan figures in the "lava-lava" costume. This view, which has been engraved in fine detail, is bordered in the corners with a portion of the stencil designs used in marking "tapa" cloth, while the upright flanking features on either side are representations of ancient Samoan wooden spears. Colours : Claret and Blue Black. Scott #168 2d. 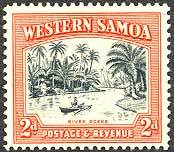 A beautiful tropical river scene, typical of many in Samoa, is reproduced in the centre panel of this stamp. It is a placid flowing stream winding its way through thick tropical forest, with stately coconut palms on the banks rearing their heads above the surrounding foliage. In the foreground a Samoan is paddling a small " paopao," the common canoe of the people. Colours : Spectrum Orange and Battleship Grey. Scott #169 2½d. 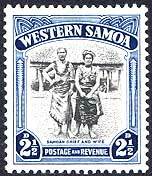 A Samoan chief and his wife are represented in this denomination. They stand together in front of a Samoan house ("fale"), its side-screens ("pola") drawn up to secure cool conditions beneath the heavily thatched roof during the heat of the day. Both figures are dressed in "lava-lava" of "tapa" cloth, which is made by beating together pieces of the bark of a species of mulberry tree. Three Samoan fans are drawn in the upper corners of the borders, and on each side is an old Samoan club. Colours : Lido Blue and Grey Black. Scott #170 4d. 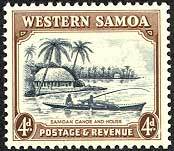 Prominent in the pictorial panel of this stamp is a Samoan deep-sea fishing canoe showing two fishermen paddling, and the long heavy rod used in catching the bonito. This type of canoe is usually called a "bonito canoe." A roll of nets is to be seen in the craft. 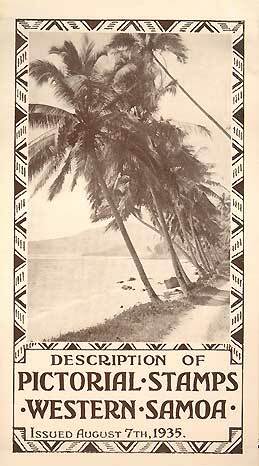 The background is a characteristic Samoan coastal scene; two pretty promontories with Samoan houses ("fale") nestling among the coconut palms, whose sharp outlines break the skyline. There is a particularly clear representation of a well-constructed "fale" in the middle distance.Colours : Coffee and Blue Grey. Scott #173 2s. 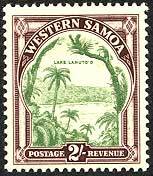 Samoa is of volcanic origin. Lake Lanuto'o, illustrated in this denomination, is a small water-filled crater on one of the high peaks in the middle of the Island of Upolu. Dense forest is seen in the background, and the picture is partly framed by overhanging fern-covered trees, the borders reproducing the round poles with their sinnet binding used in the interior of Samoan houses. Colours : Purple Brown and Cossack Green. Scott #174 3s. 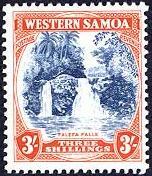 One of the best-known beauty spots in Samoa, Falefa Falls, twelve miles east of Apia, is depicted in this value. A clear mountain stream rushes down over the falls in heavy volume, its waters divided by a large rock. The forest frames the scene, and the design for the borders is based upon that of the plain weaving of the commoner type of Samoan mat. 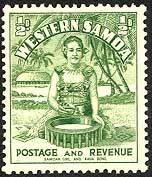 The denomination is shown in white at the bottom corners on shields shaped like Samoan fans. Colours: Gold Brown and Mineral Blue. 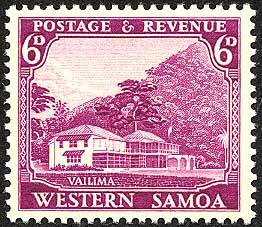 WESTERN SAMOA is administered by New Zealand under a Mandate from the League of Nations. The two principal islands of this section of the Group, Upolu and Savai'i, have bold rugged scenery and are among the most luxuriant in the South Pacific. 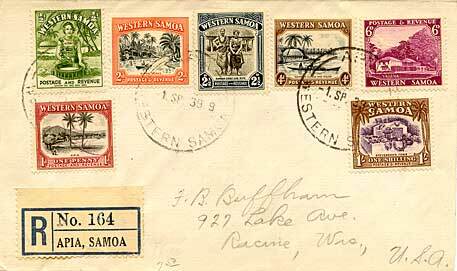 Consequently, the New Zealand Administration, in deciding that Samoa should be provided with a complete stamp issue, was able to draw upon attractive resources for pictorial subjects. 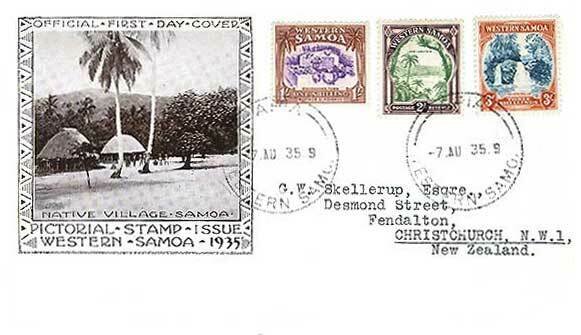 Only one pictorial stamp had previously been in circulation, a Samoan scene having been adopted for all denominations. 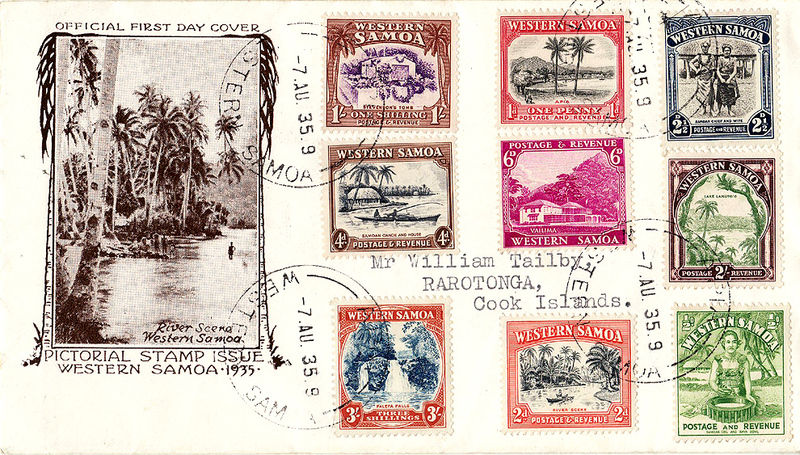 These Samoan Pictorial stamps constitute a miniature view-book of the Territory, for they include reproductions of some of its most distinctive features, and portray the Samoan in traditional dress and appropriate surroundings. The engravings have been so carefully done that the subjects they represent will be readily recognized by those familiar with Samoan scenes, though even the use of two colours in printing has not made it possible to present the pictures in the glowing and vivid colouration of the tropical originals. The selected design for the ½d. denomination was drawn by Mr. L. C. Mitchell, Wellington; the 2½d. design was the joint work of Messrs. Mitchell and J. Berry, Wellington; the 6d. was drawn by Mr. W. J. Cooch, Wellington; and the remaining designs were those of Mr. J. Berry. They have been printed by Messrs. De la Rue and Co., London, by the intaglio process, on "N.Z. Star" water-mark paper.